Meetings for YEP members are held monthly in The Freight Room, located inside the DeKalb County Community Foundation at 475 DeKalb Avenue, Sycamore. 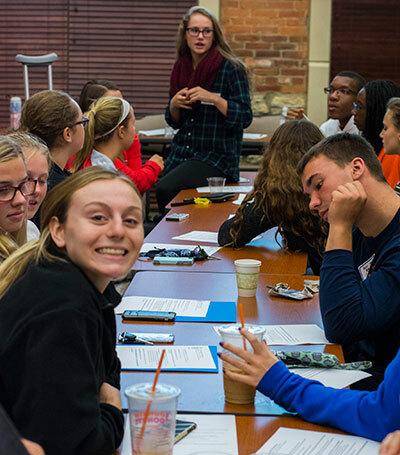 All meetings are led by the youth executive committee and will feature a theme or speaker to help youth members understand the many facets of grantmaking. A list of monthly topics can be found in the 2018-2019 Member Meeting schedule. YEP meetings in October, November, December, January, February, and March, are held on a weeknight from 6:30 - 8:00 p.m. The August (Meet & Greet), September (Orientation), April (Allocation) and May (Grants Reception) meetings are a little different in content, meeting time, and expectations. What are YEP Outreach Events? YEP Outreach Events are volunteer opportunities that YEP members participate in as a group. Each outreach event is chosen based on certain criteria. Criteria includes location in the county, number of volunteers needed, organization represented, and the overall direct or indirect impact to youth. Through volunteering, YEP members learn about community-serving organizations in DeKalb County and have multiple chances to work alongside them. YEP members are encouraged to participate in at least one Outreach Event. Each Outreach Event will have an adult advisor (Community Foundation staff or Board member) on site during the event. The role of the adult advisor is to act as the main contact and encourage those who are volunteering. YEP Outreach Events for this year include: Feed My Starving Children Mobile Food Pack event, more coming soon! If you or your organization has a desire for youth volunteers, please fill out the Volunteer Request Form. We'll review the information, compare it to our volunteer criteria, and follow up with you on the best fit for your request. In an effort to stay true to the mission of the YEP program, volunteer opportunities are divided into two categories, YEP Outreach Events and Additional Volunteer Opportunities. If you have questions, please contact YEP Staff Advisor Noah Nordbrock at noah@dekalbccf.org or 815-748-5383.